What do you think is inside this 3-D work by Lee Bontecou? 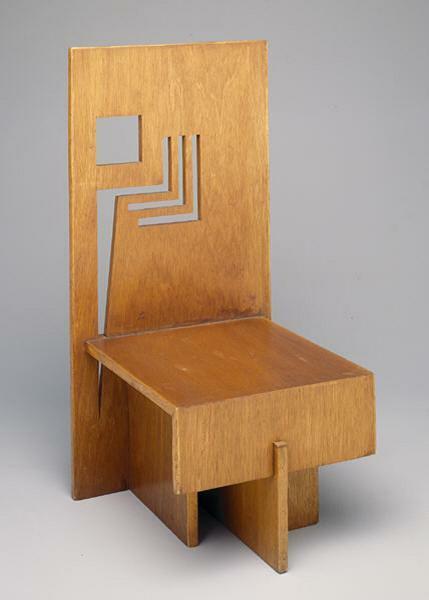 Feel inspired by Frank Lloyd Wright’s plywood side chair? At the Space Bar in the Center for Creative Connections, we challenge you to really experience art and take what you see in our exhibition to make your very own work. As the Coordinator of C3, I continually save creations left by Museum visitors. So do my DMA colleagues. Some we hold onto because of their extraordinary use of materials and some we save simply because we like them. Many works end up on the desks of C3 staff and the walls of the Center’s Director. However, we mostly save them to document the every-day happenings in the Center. During the Center’s first exhibition, Materials & Meanings, we filled several file cabinet drawers full of works of art visitors left on the Materials Bar shelf. For our current exhibition, Encountering Space, the C3 staff worked closely with DMA designer Jessica Harden to allow more display room specifically for the Space Bar. Now the Bar has nine shelves that extend to the ceiling providing Museum visitors with plenty of room to leave their work and become part of the exhibition. One of my all-time favorite creations was made by a visitor on a Late Night this past fall. She made a dragon out of a cardboard box, tape, and pipe cleaners. The cardboard box was completely transformed till it was unrecognizable. “Visual conversation” is how another visitor described the ability to leave your work of art at the Bar. From dragons to drum kits, houses to fully composed songs in visual form, art left at the Space Bar provides you an opportunity to get involved in your museum: create, respond, express, and say something. You too can contribute to the Encountering Space exhibition by creating a response to a work of art or literally making up your own. Every other month the supplies and art-making materials change allowing the artist-in-you to surface each time you visit the Museum. We encourage you to unleash your creativity to transform and manipulate unexpected materials like color-coated wire, pipe cleaners, masking tape, cardboard boxes, and aluminum foil. The Space Bar is open during regular Museum hours and there is no need to reserve a spot. Your creations might just be featured on Facebook or a future blog post! The Center for Creative Connections invites you this spring to explore the Encountering Space exhibition with a fresh perspective inspired by designed spaces. 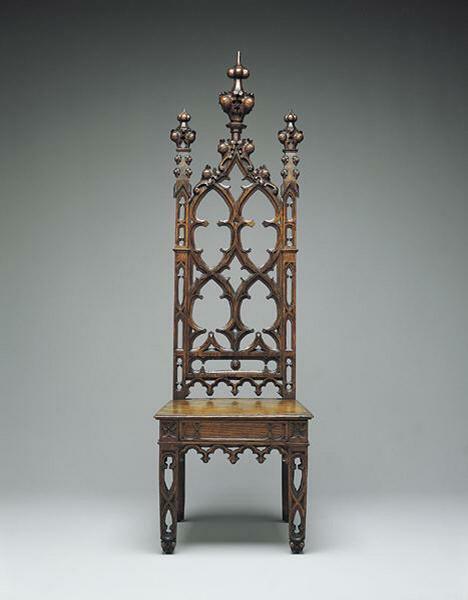 Experience changes on view March 12 – September 30, 2011 throughout the Center including two additional works from our Decorative Arts collection shown below. Get involved and share your own photographs of designed spaces on Flickr, www.flickr.com/groups/dmadesigned. 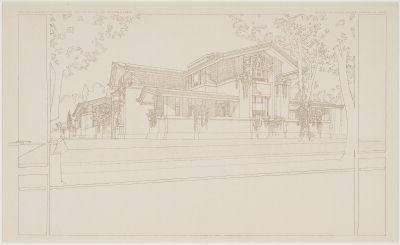 This weekend the Museum will open Line and Form: Frank Lloyd Wright and the Wasmuth Portfolio, an exhibition drawn from a monograph of prints based on drawings produced by the architect and his studio that is widely recognized as one of the most important architectural publications of the 20th century. Having already gained prominence for a number of innovative residential projects in Chicago, Wright collaborated with a German printer in 1910 to create and distribute the portfolio to promote his work to a larger audience in the U.S. and abroad. The portfolio helped establish Frank Lloyd Wright’s reputation, and he went on to a long and prolific career as the century’s most iconic American architect. As Frank Lloyd Wright’s reputation grew in the decades following the publication of the Wasmuth portfolio, the city of Dallas burgeoned as well; it is no wonder that Dallas’s civic and artistic leaders would look to the foremost American modernist architect to put his stamp on this growing, forward-thinking city. In 1934 Stanley Marcus – the legendary Dallas stylemaker and retailer – and his wife began plans to build a house for their family in East Dallas, near White Rock Lake. 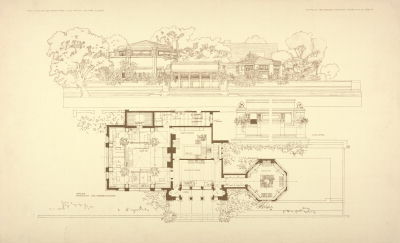 As Mr. Marcus wrote in his autobiography, Minding the Store, the search began with architects based on the East Coast, as “modern architecture had not been discovered in Dallas up to that point.” After interviewing several prominent architects, the Marcuses met with Frank Lloyd Wright to seek his advice on potential candidates; Wright responded, “Why take the imitation while you can still get the original? 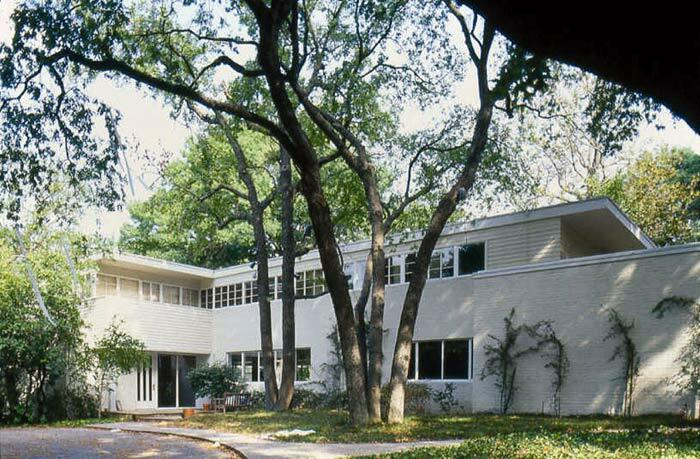 I’ll do your house.” Unfortunately, the project was never completed with Wright’s designs; the notoriously temperamental architect was fired from the project, and the house was eventually completed by a Dallas-based architect, Roscoe DeWitt. On Saturday I’m looking forward to attending the Legacies Dallas History Conference and especially to hearing Charles Marshall’s lecture When Frank Met Stanley: Frank Lloyd Wright and Stanley Marcus. Also, the Dallas chapter of the American Institute of Architects publishes a great quarterly publication entitled Columns; the Fall 2010 issue includes two articles about the Stanley Marcus house, which you can read online. 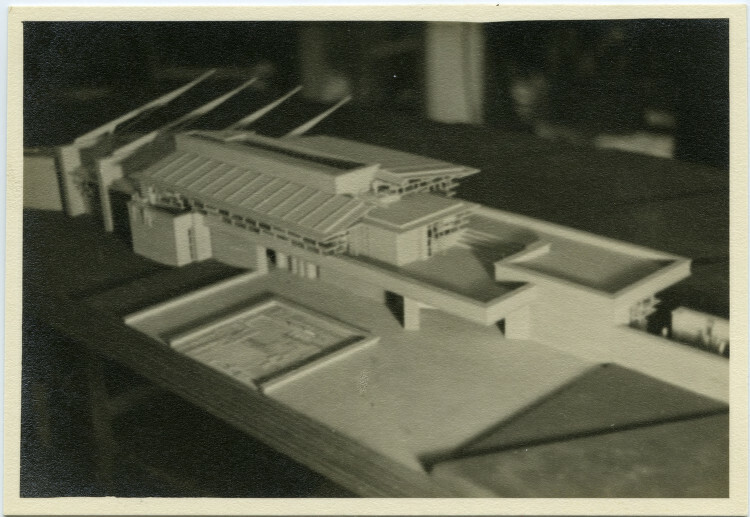 The original model for the Marcus House, as designed by Frank Lloyd Wright. Despite a rather inauspicious start, Frank Lloyd Wright did receive several important commissions from Dallas clients throughout his career. 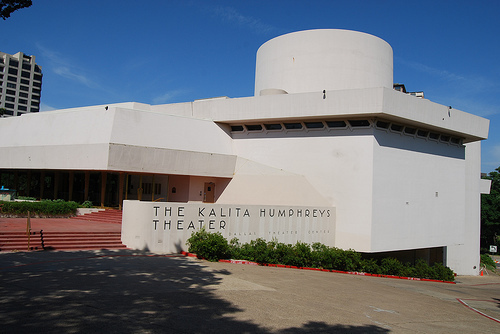 Perhaps the most notable project to come to fruition was the Kalita Humphreys Theater, which served as the primary home for the Dallas Theater Center for fifty years – from 1959 until 2009, when the company moved to the Arts District and the new Wyly Theater. 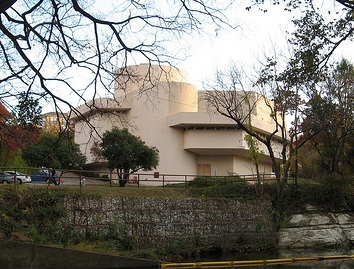 Although based on earlier, unrealized theatrical designs, the theater was considered to be very innovative, and it expressed the architect’s long and strongly held principles about integrating a building into context, or the “belief that architecture has an inherent relationship with both its site and its time.” The Kalita Humphreys Theater would become one of Frank Lloyd Wright’s last projects, as he passed away just months before its construction was complete. I enjoyed these interviews with members of the Dallas Theater Center company about working in a Frank Lloyd Wright building. 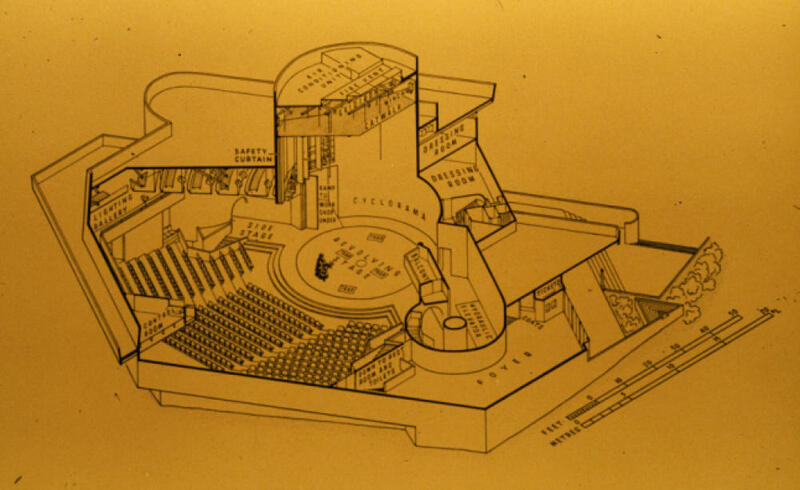 The plan of the Kalita Humphreys Theater. Image from the Hekman Digital Archive. Take a closer look at Wright’s final project the next time you walk or ride on the Katy Trail along Turtle Creek, and explore his early masterpieces through selections of the Wasmuth portfolio, which will be on view at the DMA from January 30 until July 17, 2011.